Careful...cubs are addictive...start out with one, and before you know it you have a heard!!! Just ask other members! And so far, there is NO CURE! Pretty soon we will be welcoming you to the MCC (Multiple Cub Club)!! So if I go to check oil pressure with my manual gauge whats an exeptable pressure at idle? Set the timing with a timing light, if you didn't. The engine should have more power than to stop when you push the clutch pedal down. The wrong timing can make it have less power. The throwout bearing in a Cub does not turn, it is solid, so it can make some drag on the pressure plate fingers when you push the clutch pedal down. It has a grease fitting, remove the hand hole cover, and grease the fitting, like it shows in the owner's manual, if you didn't grease it. There should be a small hole in the top of the throwout bearing for excess grease to come out. I put a small amount of grease on the front surface of the bearing, with one finger, and wipe it around some, that reduces the friction there. That should make less drag when the engine is running, and you push the clutch pedal. Use a light and look in the hole, and you can see the throwout bearing. The throwout bearing can wear down with lots of use, you should look and see if it is still good. The graphite material sticks out of a new bearing 5/16". Below is a pic of a new throwout bearing. 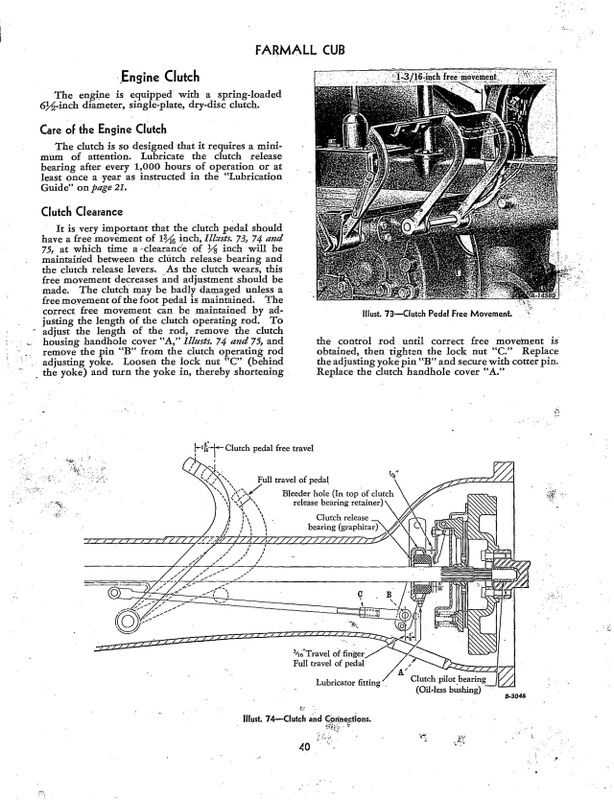 Below is a page from the 1947 Cub owner's manual showing the clutch, and the pedal free play adjustment. IH changed the free play adjustment at serial number 32229, so yours should have the 1st style of adjustment. It is inside the housing, by turning the yoke on the rod. They are hard to get to. Hopefully you still have the right free play, and you don't need to adjust it. The free play is measured at the surface you put your foot on. You said the clutch pedal works hard. Sometimes the pedal gets tight at the base, from no lube. It should work freely at the top in the free play range, except for the return spring, under the platform pulling the pedal up to the edge of the platform. The pedal base should work freely through it's whole travel, the pressure plate, and return spring, make the resistance. If the pedal is tight in the clutch housing, lube it with penetrating oil, and work the pedal and loosen it up. It might take some time. When it is loose, lube it with motor oil. Lube the brake pedal pivots too. All 3 pedals should have return springs. 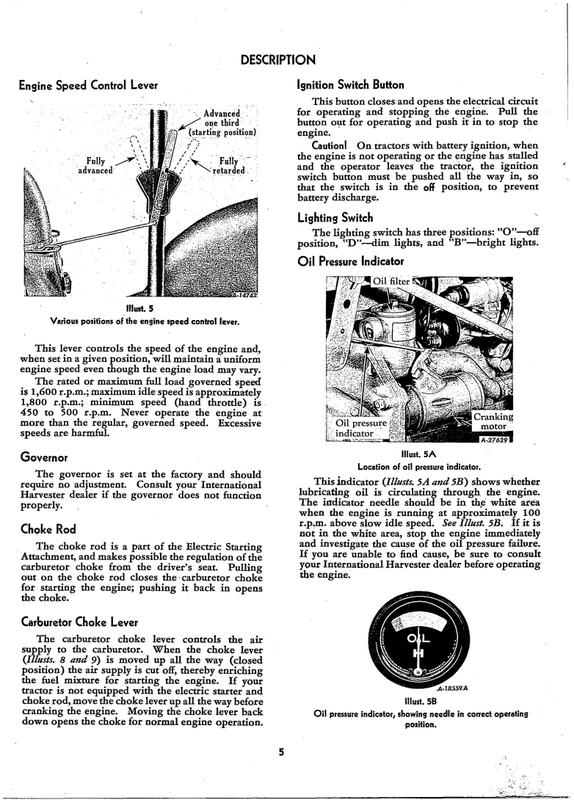 Below is info about how much oil pressure the engine should have, from the 1949 Cub owner's manual. It is the paragraph at the lower right of the page. You can see the red zone in the pic from TM Tractor that I posted before. The red fades away sometimes on old gauges. If the gauge is a 40 lb gauge, like the gauge used beginning in the mid 1950's is at TM Tractor, then the red zone on the older gauges would be at about 10 lbs and below. But I'm not totally sure if they are 40 lb gauges. Maybe Jim B. can say what they are. 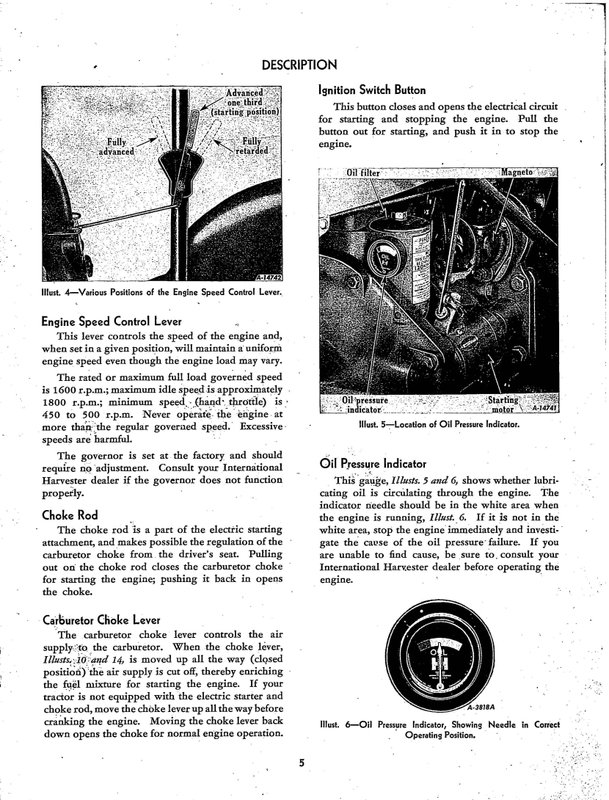 They were saying a little different in the 1955 Cub owner's manual. If you remove the old oil gauge, I've read that guys on here have tested them with air pressure. The 3rd pic, from TM Tractor, shows the clutch pedal pivot. About 2/3 of the length of the shiny part needs lubing. Well I'm not so much worried about the oil pressure any more as much as I am worried about the notorious crack engine block ear. I knew nothing about a cub when I purchased this tractor or I would have looked for this. As much as this has apparently happened surely some ones learned a good fix for it. I would replace the block but I'll never find one I don't think, one that's in good shape and not cracked too. If I could I don't know where to ever start looking. How come people are so against welding the crack? Really frustrated about it. This thing has alot of restoration potential. Too bad about the crack. A man on here posted that he bought a block from JP Tractor Salvage, at the bottom of the page some time ago, you could check their price. Then he put most of the parts from his engine in the replacement block, with new crankshaft bearings, etc. Engine blocks are out there and available. Several folks have made a brace to support the cracked ear. Search this site. Post an ad in The Vine for a block. Also contact JP Tractor Salvage as well as Hamiltonbobs. They are advertisers on this site. Edit. You may be able to find a parts Cub with a solid block. Welding cast iron is a pretty finicky process to get it to come out successfully. I think brazing cast iron has a much better success rate.